Dogs. Alarm systems. Security cameras. The most popular methods of home protection are looking less secure after convicted burglars spilled their secrets to the I-Team. In an unprecedented crime prevention project, the I-Team sent surveys to more than 500 people serving time for burglary or for breaking and entering in New York and New Jersey prisons. The survey included questions about how they picked their targets, broke into homes, and how potential victims could stop them. Fifty-seven convicts responded. Vincent Medina, who's currently serving a six- to 12-year prison sentence in Wallkill, New York, estimates he's committed more than 100 burglaries, breaking primarily into Bronx and Manhattan apartments. "A burglar is someone who's always looking. You're scoping, you're scheming," he told the I-Team from prison. Seventy-two percent of convicts who responded to the survey said break into houses, with more than half committing their crimes in the morning. Across the board, burglars said their break-ins were not random, with 62 percent reporting they at least “sometimes” did surveillance on homes or apartments. The goal of surveillance? Fifty-one percent said they were trying to determine the schedules of the owners or tenants, as well as their neighbors. Forty-six percent were trying to determine if the home had an alarm system, and 44 percent were looking for security cameras. “I don’t care if you have the best alarm system in the world. That ain’t going to do you no good,” said Nicholas Kyriaziz, a career burglar who’s estimates he’s done more than 100 break-ins and is serving a 40-year sentence at a prison in Trenton, New Jersey. A stunning 59 percent of the responding burglars told the I-Team an alarm system would not deter them at least some of the time: 35 percent said they would break in and be gone before the police arrived, 21 percent said they could disarm the system, and 18 percent would confident they wouldn’t trigger it in the first place. 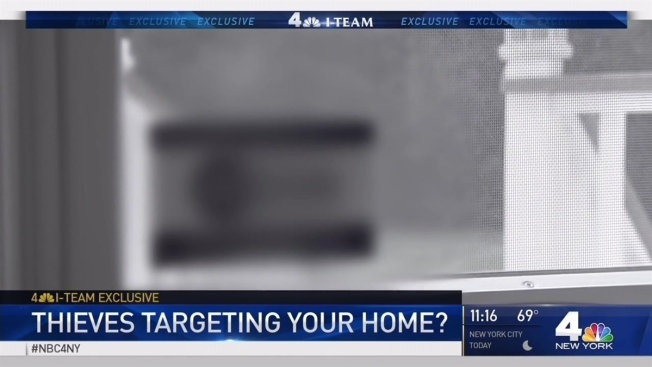 Several thieves said they had used social media to case targets for break-ins when responding to a survey the I-Team sent to 500 convicted burglars in New York and New Jersey. More than 10 percent of those 57 respondents said they've logged on to find targets and good times to strike. Sarah Wallace has more insight from one imprisoned thief. Surveillance cameras seem to be a bit more effective. Thirty-seven percent of burglars said they would not break in if they spotted a camera. But 44 percent said they would still continue, with many saying they would simply wear a mask or avoid the camera. When it comes to other deterrents, burglars scoffed at lights on timers when people aren’t home. Seventy-two percent said that was no deterrent at all. A better method, some suggested, was leaving a TV or radio on when a resident was gone. Dogs also don’t do much to stop thieves. Thirty-five percent of burglars said they would break in if there was a dog inside, and 30 percent said they might. The reason? Dogs can be distracted with food. “Dollar store Beggin’ Strips work wonders,” one convict wrote.